The last full day of the trip! AND the day of the game! We spent the morning driving around and then relaxing and watching some more Olympics. Funny sign of the day: at a bakery on the marquee - "Homade Goodness." NOT "Homemade Goodness" but "Ho-made Goodness." Around lunchtime, we got a call from my dad who was on his way to Green Bay for the game. Apparently, the staff at Nick's residential treatment place had called and asked him to take Nick to the doctor for his finger. They made an appointment for 3:15 - the tailgate party we had tickets to started at 4! My dad wanted to know if we could watch my other brother, Alonzo, while he took Nick to the doctor. Around 3, we met my dad at Nick's and took Alonzo with us. We headed almost straight to the tailgate party. Alonzo ate some food (impressive for him!). Paul's phone rang around 5 & it was Nick. He was so excited to tell Paul that his finger was broken! Apparently, when Paul threw the ball it chipped the corner off of one of the bones. Nick got a splint and his hand wrapped in "green for the Packers." 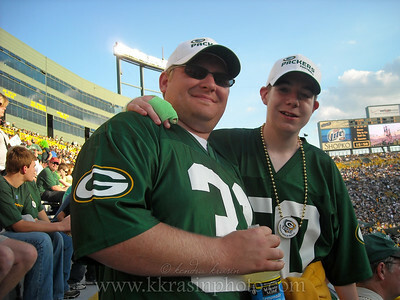 We met my dad & Nick at Lambeau before the game. We watched warm ups and then, of course, the game. 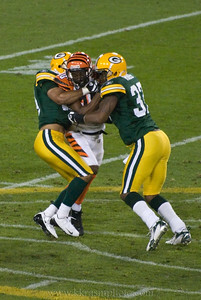 The game was a lot of fun, even though the Packers lost. 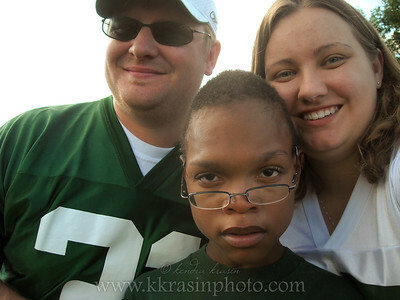 To see more pictures, go to http://www.kkrasinphoto.com.